There has been a lot of talk in the press recently about the cost of a CenterParcs break, particularly in the school holidays. Indeed, there is much debate about whether holiday companies should be forced to lower their prices to accommodate those that need to travel during the school holidays. Whether this is right or wrong, is a debate for another blog, but there is a way that you can make a CenterParcs break more affordable: by going abroad! 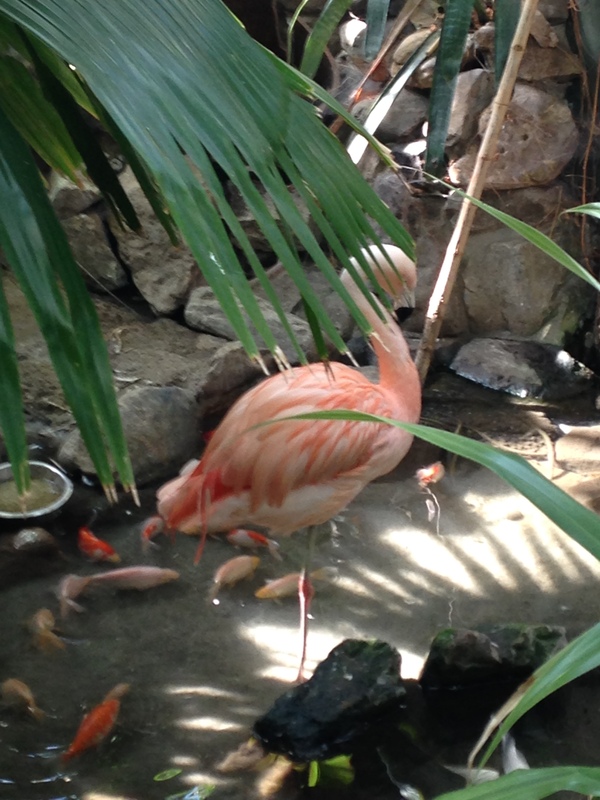 CenterParcs isn’t exclusive to the UK; in fact it only migrated across the channel to our shores in 1987. It’s actually a Dutch company with the first village opening in De Lommerbergen in the Netherlands in 1968. It’s also a lot cheaper to visit one of the European villages, so perhaps it’s time that we stopped complaining about their prices and went continental?! Mr Lighty and I were in the market for an economical break ourselves this year. We’d looked at a week somewhere sunny but couldn’t find what we wanted within our price range (champagne tastes and lemonade money! ), and we’d also looked at CenterParcs in the UK. We just wanted somewhere to chill out! Then the idea of CenterParcs on the continent struck us. Assailed by doubts (would it be easy to book? Would it work out any cheaper? Would we have a clue what was going on once we got there?!) we turned to TripAdvisor. Did you know that the CenterParcs villages are reviewed on TripAdvisor, just like hotels are? Our doubts were quietened by the numerous UK reviewers expressing how easy it was to book on the CenterParc’s dedicated website for bookings originating outside of the country the village is located in, how all of the staff spoke great English, and the great value for money that the parks offered. And they weren’t wrong! Within 24hrs we were booked off to the Eperheide resort in Belgium! Of course, one of the joys of going abroad to one of the parks is the fact that it does feel like more of an event, more of a ‘holiday’ when you leave British soil. It also afforded us stops in somewhere other than a service station. We made the most of our journeys, and stopped in Antwerp outbound and Ostend inbound. 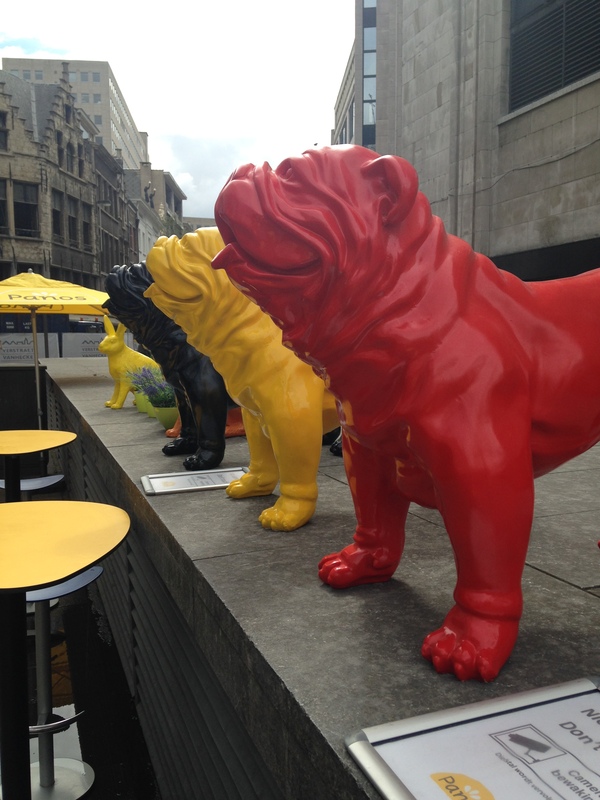 Antwerp was beautiful – the gothic Cathedral, the town hall covered in flags from every nation, and streets peppered with brightly coloured Belgium Bulldogs. 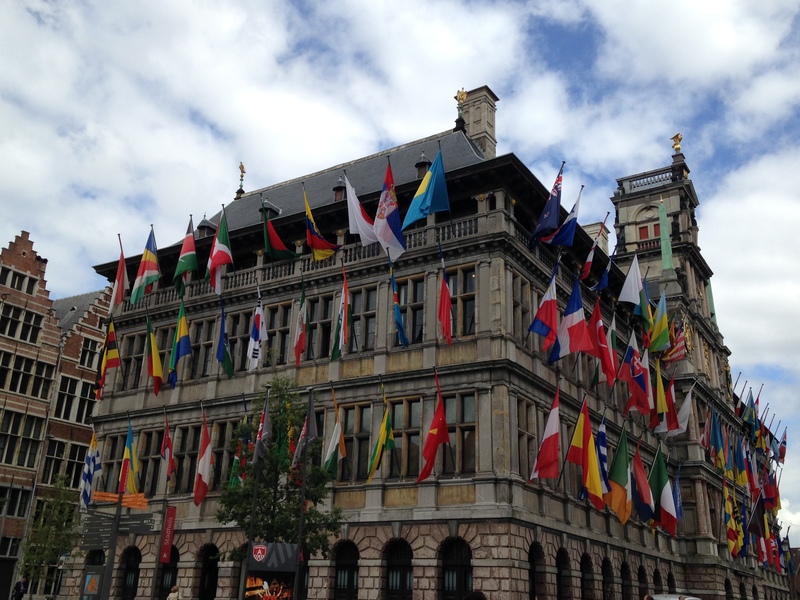 We had enough time for a spot of shopping and a traditional lunch in a bistro on the square overlooking the town hall, and we decided that Antwerp definitely needs to be on our list of places to return to. 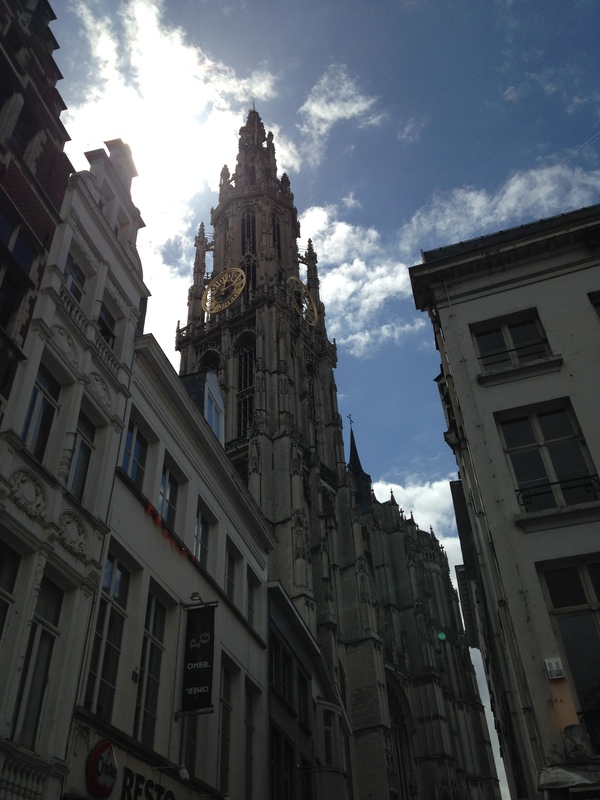 Our lunchtime view: Antwerp’s town hall. 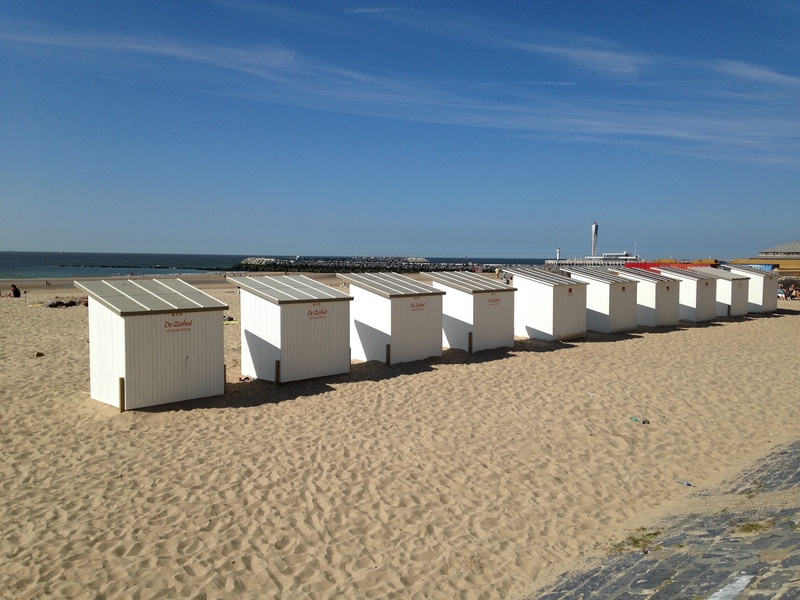 Ostend, on our return, was quite the contrast: lovely but in a completely different way. This was your typical beach resort, with a sweep of white-gold sand at its heart, albeit with another striking cathedral to admire. Mr Lighty even joked that we might find some British-style amusement arcades…and we promptly stumbled across one! 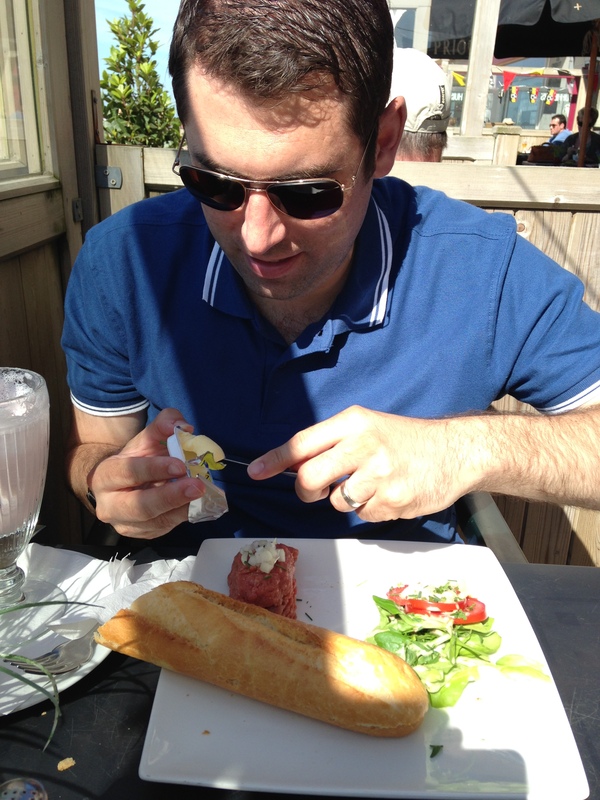 Mr Lighty’s unsual sandwich: yes that is just a lump of mince meat, a hunk of bread, some butter and some salad! After our sojourn in Antwerp, we drove on, deep, deep, deep into the forest, past sleepy Belgian towns and even a military compound to CenterParc’s Erperheide village. Located right on the Dutch border, it’s about a 3 hour drive from the Channel Tunnel. On arrival, we were greeted by a cheerful chap, who apologised profusely for not realising we were English and therefore initially speaking to us in Flemish, and were handed a cute little welcome package presented in a miniature suitcase. We had booked the two person cabin for the weekend, and while cute and clean, first impressions were that it was slightly more basic than those in the UK. Having said that, you can keep costs low by bringing your own linen, which is the option we opted for. Of course, if you want to hire sheets and towels you can, but in the interests of a budget blog, this is definitely one way that you can save money. As is bringing your own food from home, although be warned that you will only have a two ring hob in the more basic cabins, so you might have to improvise if you were expecting an oven like we were! 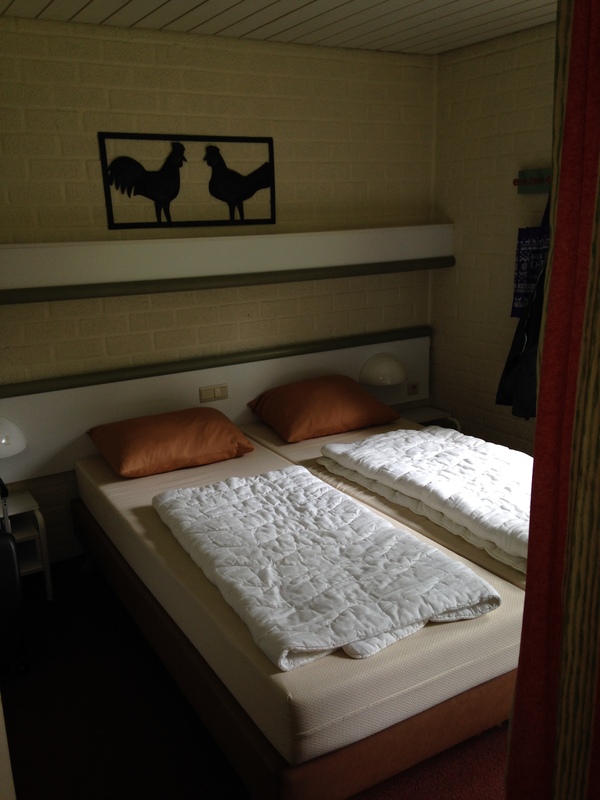 The unmade beds – remember to bring your own sheets if you want to keep costs down! When it comes to the facilities at parks abroad compared to those at home, you won’t be disappointed. The village at the heart of the park was not dissimilar to our local CenterParcs, Elveden Forest in Suffolk. Having recently undergone a refurbishment of the restaurants, there is plenty of choice, all set amid a tropical-feeling island hub. We particularly liked the buffet restaurant, which we certainly got our money’s worth in, and the Grand Cafe, reminiscent of an old American coffee house and where the menu is presented as a newspaper. This is also the place to be if you want to enjoy the evening’s entertainment, which included, whilst we were there, a rather raucous disco and crazy bingo (in every language but English. We had no clue what was going on!). 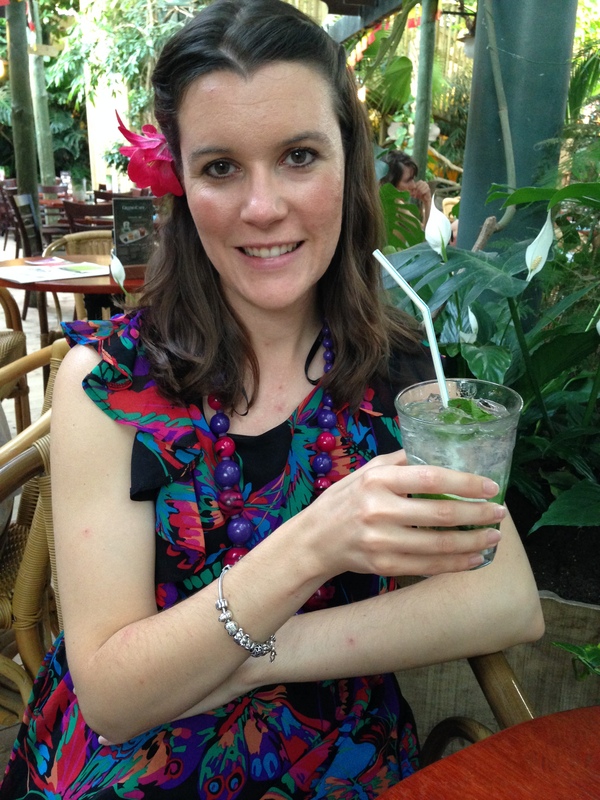 Enjoying a drink in the Grand Central bistro! You can also enjoy half hour’s free wifi access in the village each day; yes this is very different to the Centerparcs at home whereby you can use the wifi in the chalet constantly, so if you’re a techno addict, you might want to up your budget to include a wifi package. Of course, the centrepiece of any CenterParcs stay is always the swimming pool complex. Each park on the continent has its own theme to a certain extent, or something that stands it apart from its counterparts, and at ours, this stand-out-piece was a snorkelling pool. After paying €2.00 for a pair of goggles, one can swim down to the darkest depths of the pool and peer into the glass tanks which line it. If you’re lucky, a piranha might stare back! Aside from this, the complex also had the standard wave pool and rapids, as well as various slides and a turbulent lazy river. On our last day, the weather was glorious enough for us to even enjoy a laze on the stone sunbeds of the outside pool, complete with a visit from a local duck! In fact, the weekend was fraught with wildlife – from pecking hens through to rampaging sheep – and if you’ve got little ones, they can even enjoy a farm keeper experience as part of their stay. 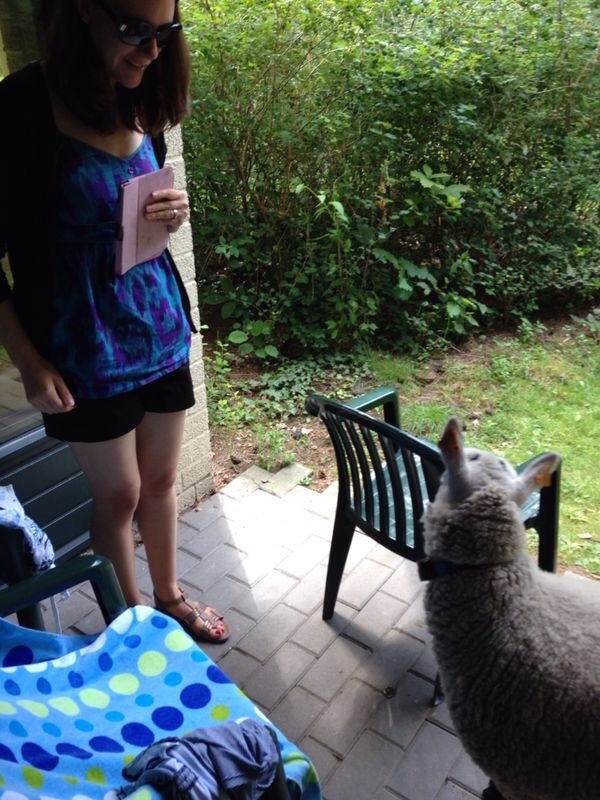 Would I go again to CenterParcs on the continent? Yes I probably would, but I’d also probably upgrade to a slightly plusher cabin if funds allowed. Mr Lighty and I have always loved Belgium, and the friendliness of the staff – and their helpful knowledge of English, considering we were the only English in the village! – couldn’t have been faulted. Sometimes even Mrs Lighty has to put her champagne tastes to one side. 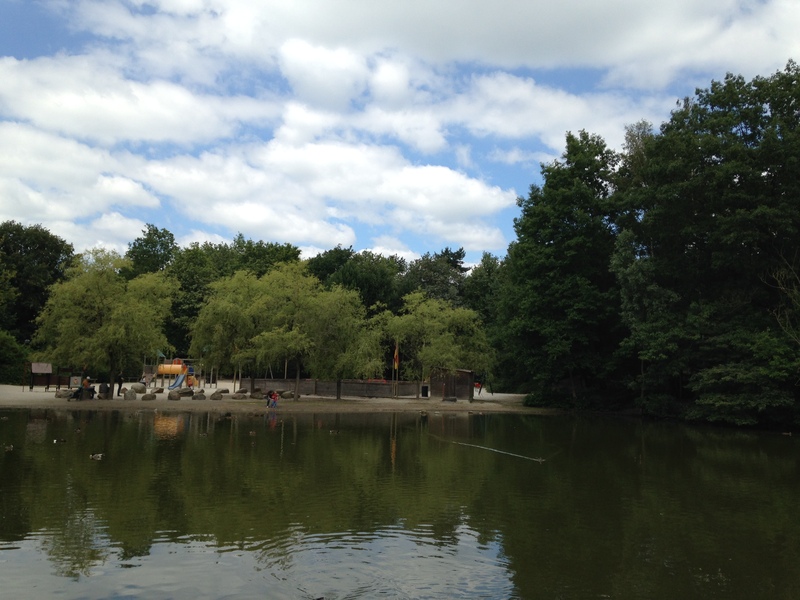 If you’re looking to do CenterParcs on a budget, it’s definitely time to go continental! 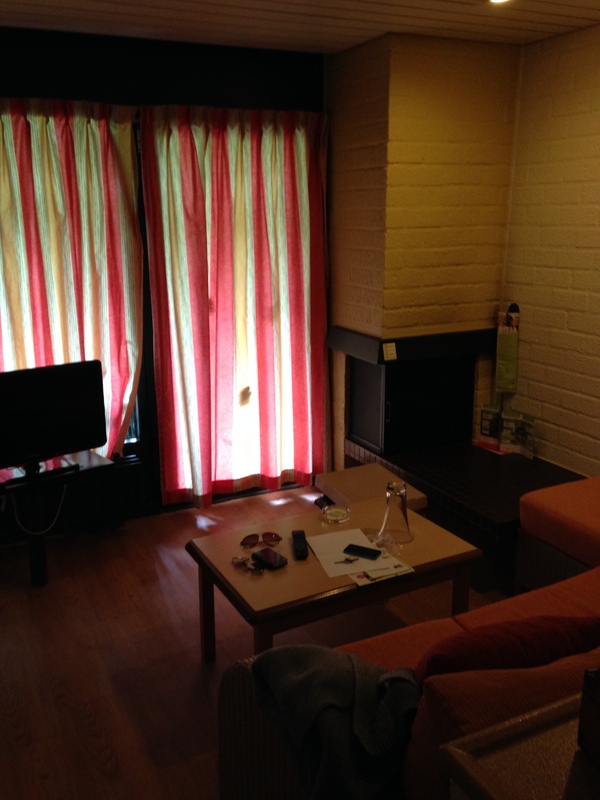 This entry was posted in activity holidays, Centreparcs, Forest Holidays, Self Catering Holidays and tagged Antwerp, Belgium, Budget Breaks, Centerparcs, CenterParcs Eperheide, CenterParcs on the Continent, Eperheide, Forest Holidays, Ostend, Scenery, Self Catering Holidays. Bookmark the permalink.